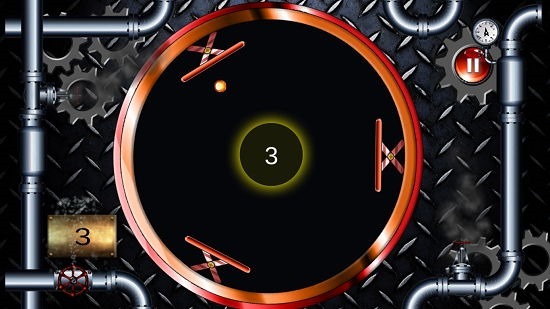 Tri Bounce is a free game for Windows 8 and 8.1 in which you have to rotate the paddles in the circular ring by clicking and rotating with your mouse, and ensure that the ball bouncing off the paddles doesn’t crash. In the game, before the game starts, you will be shown a ball at the center of the screen which can fall in any direction. This ball is present inside a circular ring which also has three paddles on the periphery towards the inside of it. You have to rotate the ring in such a way that the ball falls on any of the paddles and doesn’t crash on the periphery of the ring. If it does, then it’s game over. Tri Bounce is available for free from the Windows App Store. 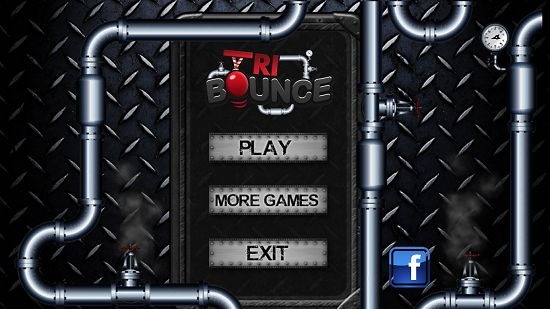 When you run the Tri Bounce game app on your device, you will be presented with the below interface. In this screen, you can choose to start the game, exit the game or view more games by the developer. 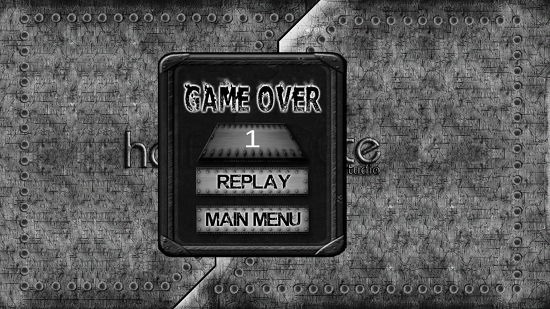 If you click on the Play button at the center of the screen, you will be brought to the gameplay screen of the game wherein you will be able to see an interface like the below screenshot. This is the same interface which I talked about in the introduction of this article. As you can see, three paddles are present inside the ring which have to be rotated in a way that the ball doesn’t crash on the walls of the ring. You can see your current score at the center of the screen, and you can see your highest score in the game at the bottom left. The game works super well on touchscreen devices as well where you can simply hold anywhere inside the ring and rotate your finger in the desired direction in which you want to rotate the ring. The same can be done with the mouse as well, the only difference being that you have to press and hold the left mouse button while you perform the same gesture. When the ball crashes on any wall of the ring, your game is over and you’ll be shown the game over screen as can be seen in the screenshot below. From this screen, you can choose to restart the game or return to the main menu of the game. This wraps up the main features of Tri Bounce for Windows 8 and 8.1. Tri Bounce is a well-designed game which is incredibly fun to play and while away your time when you’re bored. You can get it from the link below.